A super quality, Wedgwood, miniature dark blue jasper dip vase. This piece is marked ‘WEDGWOOD ENGLAND’ and it dates from c.1895. Proper miniature items were made as cabinet items and they weren’t made in any great quantities in this period. This piece is decorated with a continuous band of classical figures and trees and the reliefs are very finely detailed. 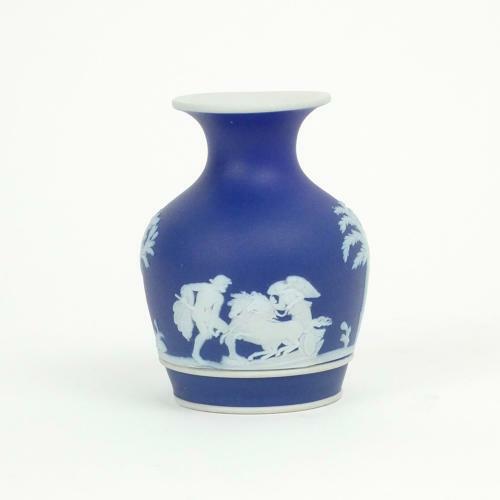 The jasper dip is a good, rich shade of blue and the vase is in excellent condition. Price includes postage with the U.K. Shipping to the U.S.A. add £15. Western Europe add £8.